Capable to export all details from Excel sheet i.e., name, phone, email, etc. 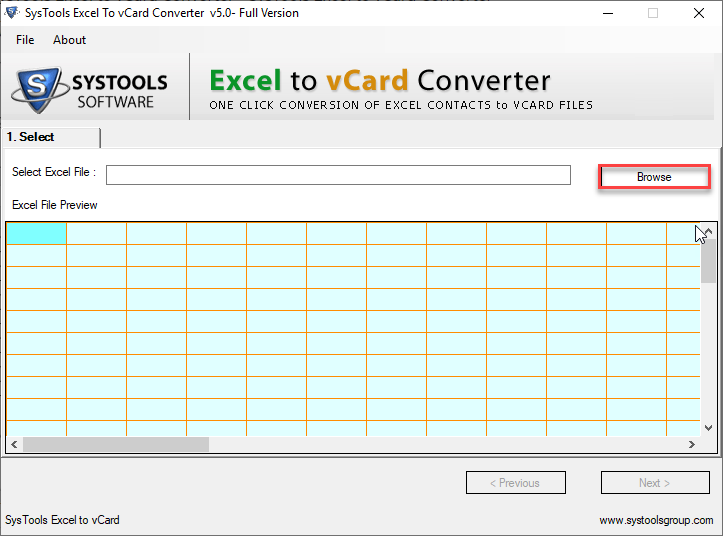 MS Excel installation required to convert .xls to vCard file. The Excel file to vCard Converter program transfer multiple Excel contact list to VCF in batch. It creates a single .vcf file for each contact present in the Excel spreadsheet. This application performs a safe conversion of Excel contacts to vCard file without causing any changes, damage or data loss. Also, the user can view each row or column with its respective data. 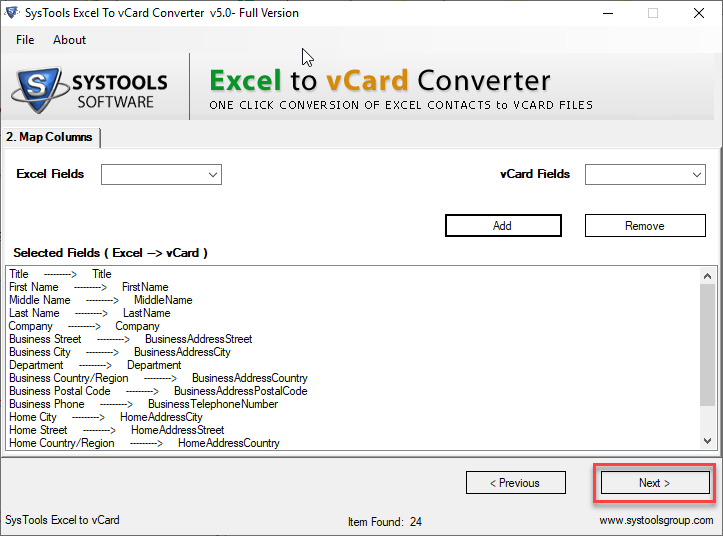 This Excel Contact list to vCard Converter Tool is the comprehensive, full-featured solution to export XLS / XLSX to vCard file format. It supports Windows 10, 8.1, 8,7 and all below Versions. Therefore, it has field mapping option i.e. Map excel columns and vCard fields. Also, The tool is designed with an interactive user interface that is not required for technical expertise. Software Informer gives SysTools Excel to VCF tool 4.8 stars rating for its efficient working & for its best performance to convert xlsx file to vCard format. Cnet provides SysTools XLS to vCard Converter Tool 4-star ratings from its performance efficiency and output accuracy during the process to convert Excel file to vCard file format. 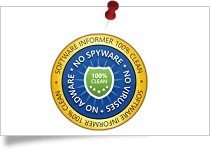 XLS to VCF exporter application gets 4 Star Rating from softpedia for delivering Ad/Spyware free solution. Organizational ID Number, Profession, Car Phone, Radio Phone, Account, ISDN, Keywords, Telex, Priority, TTY/TDD Phone, Mileage, Billing Information, Hobby, Directory Server, Private, Sensitivity, User 1, User 2, User 3, User 4, Categories, Business Address, Business Street, Business Street 2, Business Street 3, Business Address PO Box, Business City, Business State, Business Postal Code, Business Country, Other Phone, Other Fax, Other Address, Other Street, Other Street 2, Other Street 3, Other Address PO Box, Other City, Other State, Other Postal Code, Other Country, Callback, etc. Once you browse and add XLS or XLSX file, the software will generate an instant preview of the entire Excel file. You can view each row and column with its respective data. 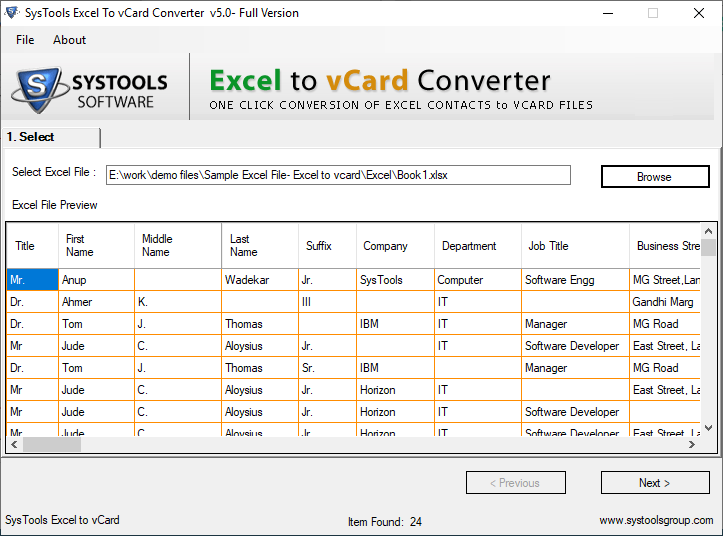 Also, the Excel to vCard converter will browse all other file types created by MS Excel. For example, XLS, XLSX, XLSX, XLT, XLSM, XLSB, XLTX, ODS, (Comma Delimited/ Macintosh/ MS – DOS), TXT (TEXT Macintosh/ TEXT MS DOS/ TAB Delimited/ UNICODE TEXT), DIF, SLK, DBF, TSV File. The XLSX to VCF converter software allows you to export multiple contacts from your Excel spreadsheet to vCard format at once (tested on 40,000+ contacts). You can save all the fields of an Excel file in the output vCard via mapping. 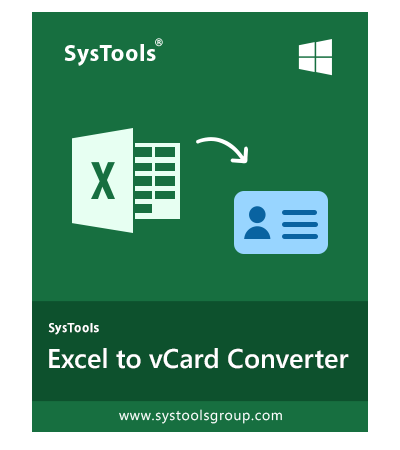 The XLSX to vCard converter will create individual .vcf for each contact present in the Excel spreadsheet. You can Export Excel Data to vCard 2.1, 3.0, and 4.0 versions according to your selection or requirement. MS Excel Spreadsheet to vCard converter tool also lets you create a single vCard file consolidated with all contacts of the selected Excel spreadsheet. In order to convert details of each column into vCard fields, make use of the mapping option. Once the XLSX to VCF Converter loads the complete Excel file, it will list all columns in the drop down menu for Excel field. Select each column name from Excel field drop down and the respective name from the vCard attribute’s drop down menu, to map the columns. This Excel to vCard Converter tool also let users open resultant VCF file in any Android phone also. The version of vCard does matter in Android phones, a user can easily import contacts from Excel to Android. One just needs to import VCF file to any Android Phone like Samsung, Huawei, Motorola, OnePlus, Nokia, etc. After creating vCard files, you can successfully import them into the MS Outlook profile, Android phones, WhatsApp, BlackBerry, Samsung, Nokia and iPhone, etc. for the further usage of the contacts. However, there is no need to have MS Outlook installed to export contacts from Excel to VCF format. MS Excel to vCard Converter provides an option to import the contacts having empty email address fields, too. Simply check or uncheck the option to import empty email address contacts in case such contacts are present in your Excel file. Once the process of export Excel data to vCard begins, the XLSX to VCF Converter displays a real time conversion report. Out of the total contacts, you can view; the number of contacts having empty email addresses and the number of contacts being converted respectively. The tool convert excel file contacts into vCard file format and by default saves exported VCF files on the desktop. If you want to save resultant VCF file(s) into a location of your choice, then you can do so by browsing for an alternate destination path on system. How to convert Excel spreadsheet to vCard? Can I get a brief idea regarding the features of .xls to VCF converter? Share some important characteristics of XLSX to vCard Converter. Create single .vcf file for each contact during Excel to VCF File Migration. Does this excel to VCF Generator software work with MS Excel 2010? Yes, XLSX to VCF converter free is fully compatible with Excel 2010 and below versions too. Also, installation of MS Excel is a must for running the tool. Can I use this excel to vCard creator tool on my Mac machine to convert Excel file to vCard format? No, this version of Excel to VCF Converter is only meant for Windows machines and cannot be installed on Mac OS. Nevertheless, we do have another version of the Microsoft Excel to vCard file Converter tool, CSV to vCard for Mac which can be installed on a Mac machine successfully. Do I need to have Outlook installed on conversion machine? No, Outlook installation is not required to import Excel to vCard. If you need to import vCard into MS Outlook, then opt the vCard Importer tool. We also provides tool which can directly perform the Excel to Outlook Conversion. Can I convert 10000+ contacts from an Excel file at once using this excel to vCard Generator tool? Yes, you can convert any size of XLS file having any number of contacts. 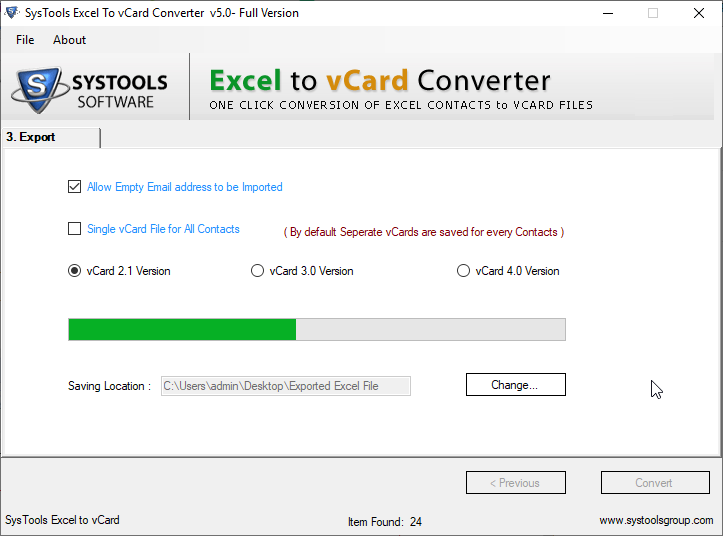 Excel contacts to vCard Converter Software does not have any file size limitation to convert XLSX file to vCard. How to get Excel contact list to vCard file in my Outlook 2013 machine (64-bit)? Yes, Excel 2010, 2007 to VCF contacts exporter supports Outlook 2013 and all its below versions as well. Is it possible to perform multiple XLS / XLSX file conversion in one go? No, you can only convert one Excel file to VCF format at a time. However, you can convert unlimited XLS / XLSX files back to back individually with this XLSX to vCard converter. Can I do mapping of the contact fields before conversion using excel to vCard creator? Yes, Excel Contact to VCF converter provides option to map every contact field from Excel file to vCard format before conversion is performed. Is it possible to create a single VCF file for all Excel file contacts while converting Excel data into VCF format? If you have such requirements, please contact our Support Team. They will provide you with a suitable solution accordingly to convert Excel file to .vcf format. I would like to convey my gratitude to the Tech Support executive who resolved all my queries like: how to get excel to vCard, how to convert Microsoft XLS to VCF, how to make excel file to vCard, etc. regarding the conversion of Excel contact list to vCard format. And I am glad I took a step forward and purchased this Excel to VCF creator tool, it comes handy every now and then. As far as saving and maintaining contacts is concerned, MS Excel spreadsheets are quite feasible. But when it comes to using those contacts and sharing them, vCard files are the only option. Thanks to your Excel to vCard Converter, without much ado, I was done with the process to convert excel file contacts into vCard file format. I have to mention the services provided by the SysTools support team to help me import XLSX to vCard format. They were there for me even in the late hours to clear my doubts regarding the installation and use of Excel Sheet to vCard Converter. Thank you all. I had to move the contacts from my Windows PC to another system for backup. Since I've used SysTools XLS to VCF file converter before for Official purposes, I purchased XLSX to VCF Converter without any doubts. The results were amazing when I convert Excel file to .vcf format. I was trying to convert multiple Excel contacts to vCard file format. But, Google apps fail (12 hrs to Convert 2000 contacts). We happened across the idea of converting Excel data into VCF format. I used the SysTools Excel to VCF converter Tool to exporting various contacts from excel to .vcf file. It helped me to easily transfer contacts from XLS to VCF format (all 30,000+ Contacts). The major aspect I like the most about this Excel to vCard tool is that it converts multiple Excel contacts at once to vCard format. XLS to VCF converter software is the just one-time investment to transfer Excel file ( .xls, .xlsx ) to vCard. After a deep research, I found this amazing XLSX to vCard software by SysTools and it is really a helpful product for professionals like me to Convert Excel file to .vcf format.